Inspiring Ideas with artist Jeanne Winters: My Story: A Swap Party! My Story: A Swap Party! 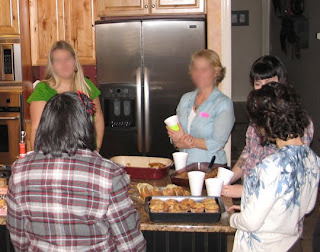 After reading about Swaps in magazines and other blogs, I knew a Swap would be a fun gathering for some of the ladies in my church circle. We've been looking for more mingling-type events to help ladies get to know one another better. Food and "free" shopping - how could you go wrong? :-) Not to mention in this economy it's also very practical. Most of us are moms of little ones, so we treasure all child-free outings. I'll share my experience with you in case you're catching the trend and thinking about hosting one, too! as well as a name tag. I am THAT person who forgets your name before you've finished telling me, so name tags helped me if no one else! 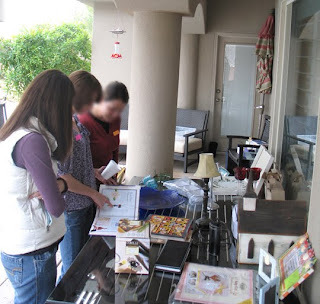 Our main goal was really just to connect people who fly by each other at church on their way to pick up the kids from the nursery, so name tags and the mixer questions were a plus! 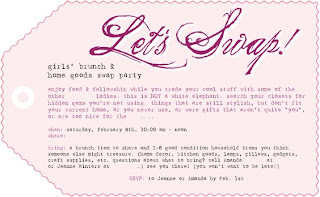 As everyone arrived, they set out their swap items and brunch treats, and got settled in. About 10:15 we began. We announced the rules: in groups of 3, ladies would shop the patio for one item. (based on their Swap #: 1-3, 4-6, 7-9, etc. So first arrivals had an advantage in nabbing the good stuff!) After everyone snagged one thing, we went around the numbers again. Each was asked to take in proportion to what they had brought. Meanwhile everyone could snack and chat. The no pressure, no all-eyes-on-me way it was set up with the wares a little separated from the hanging-out was well-received. The focus was on the fellowship. We cycled through our 20 guests three times, then we said everyone could pop out and take whatever was left that they had their eye on. A generous amount of items were brought and several of us wanted to leave with less than we had come! :-) After this last shop, anyone was welcome to take their own leftovers home. The remainders were donated to a thrift store run by our Crisis Pregnancy center. So, other than tips like "have your friend tell you your shirt label is sticking out BEFORE the event is over" I think I covered it! 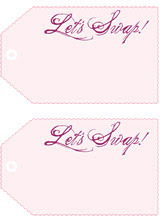 :-) I imagine we'll be doing more swap or swap-type events. The ladies who came are buzzing about what the next theme should be and the ones who missed want to do home stuff again! Let me know if you have questions or more tips to add! PS: Two of my best resources were: Better Homes & Gardens Jan. 2010, Swap till you drop article pg. 20 and this blog post by Nester. Linking this post to the DIY collection of ideas at Kimba's blog. This is such a great idea... I love it! We have a Friday Fun Find party- we'd love it if you'd link up! I HAVE been dreaming about doing this. I am in the mood to pare down my possessions and rather than just haul it off to Goodwill, I'd love for it to go to someone who really wants it and gets it free. Thanks so much for the invitation template! looks like a blast! I so wantot host one of these. Thanks for the tips and ideas . This is so helpful! I totally want to host one! Hi Jeanne. I just came across your blog, well as in about an hour ago. LOL. I love it you have so many wonderful ideas. I can't wait to come back and see more. I love how detailed you are and the great pictures you take. You're swap party looks like it was so much fun, I wish I could go. Great idea and execution. wowza! this is SUCH a great idea! and a great way to get friends from my different social circles (church, kid's school, the gym, work, etc) together in one place for fun, food, and great "take-aways"!! i am going to do it!! Sounds so fun! I've been wanting to do one of these! Thank you so much for providing the giveaway gift for TidyMom! I am looking forward to your terrific new book!!! Such a great idea and adorable invites! Thank you for sharing your template! Jeanne, what a great idea!!! Thanks so much for stopping by my blog and allowing me to discover yours - those valentine ideas look yummy! That sounds like such a wonderful idea! I'd love to do that with my friends. Great idea! I so want to do this when the snow melts! Great blog! This is a thrifty fun idea. I have been thinking about doing one of these for my friends. Sounds great. This is such a wonderful way to organize a swap without it becoming a mad dash for the good stuff! hi! Thanks for stopping by my blog on Monday and helping to make my SITS day special. Very fun! I've hosted a clothing swap before and it was great. Thank you for visiting on my SITs day! Way to go green and free at the same time! Happy SITS Thursday. Popped in to say hi! That's a great idea! This is great! I've been thinking about doing this for awhile, but didn't know quite how to organize it. You've inspired me and I am in the process of setting up a swap party with my friends! Thanks! oh my word...love this!!! came by from SITS and i'm totally thinking i need a swap! i gotta find some friends with good stuff too! ha! have a great day! What a great idea! Thanks for sharing how you did it. This looks like tons of fun! What a fantastic idea! I just love reading your blogs :) Rene W.
What a fun idea! It sounds like everyone had a great time and went home with awesome "new" things! Hi Kelly! Yes, of course you may use the wording! Have a great event!! Thank you for taking the time to create a real beneficial blog page, it's been very useful. What a wonderful idea! I am totally going to do this once it gets cooler and I can set up some tables in my backyard! Great way to recycle our wares! I'm so glad to have "found" your blog thru SITS! Just thought I'd drop you a line to tell you your www.jeannewinters.com really rocks! I have been looking for this sort of information for a long time.. I don't usually reply to posts but I will in this case. WoW terrific great.